Last weekend Phil Schappert and Derek Bridgehouse ventured to Wallace Bay in the hopes of finding Bronze Copper. In addition to finding their target, they found Acadian Hairstreak in two different Atlas squares. These are the first Nova Scotia records of the species from the Atlas period! Scott Makepeace had similar success in New Brunswick on the weekend, refinding them near Gagetown at a site he discovered in 2012, and finding them with Dwayne Sabine in a new square in Fredericton. At the Gagetown site there were at least 13 present, and at Fredericton they also found Banded Hairstreak! Acadian Hairstreak. Found near Wallace Bay on July 20 by Phil Schappert and Derek Bridgehouse. Photograph by Phil Schappert. 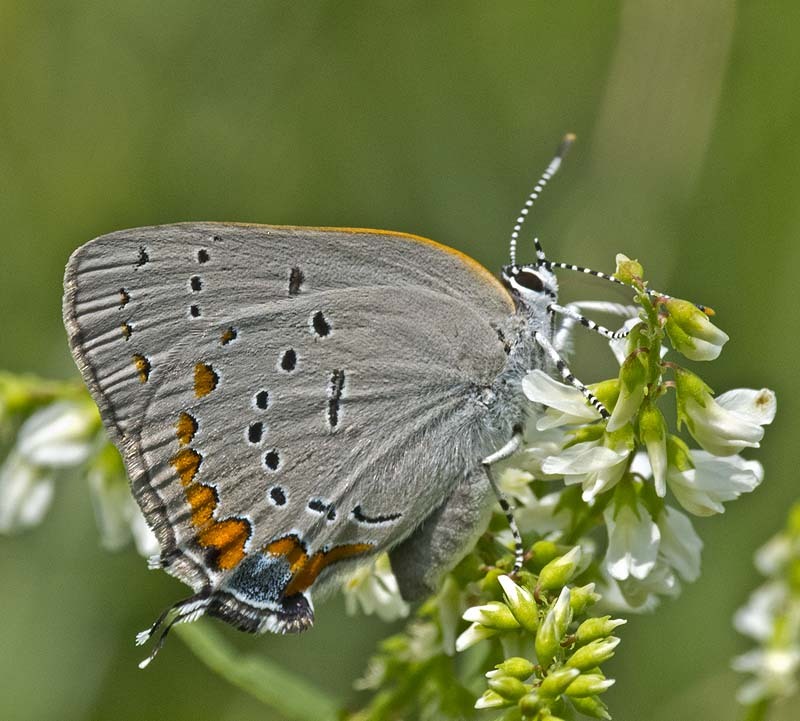 Acadian Hairstreak occurs in small colonies in habitats with willow, their larval host plant. Sites Scott visited were fields that are occasionally mowed or “brush-hogged”. Both sites had a lot of willow amongst the grass and other shrubs. The butterflies were difficult to see unless they were flushed from the willows. To find them it helps to tap on the bushes with a net or stick, scaring up the butterflies. For more information on surveying for Acadian Hairstreak see the target species guide. This appears to be a good year for Acadian Hairstreak, so it’s a great time to find new populations! While there’s no guarantee you’ll find the species (many seemingly suitable sites are unoccupied), it is guaranteed that you’ll find other butterflies while you’re looking!